Reference Publication: Floyd, Parker, McIlvaine, Sherwin, "Energy Efficiency Technology Demonstration Project for Florida Educational Facilities: Occupancy Sensors, FSEC-CR-867-95. 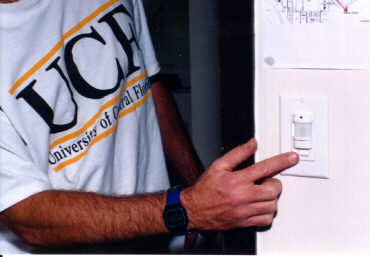 In 1995 the Florida Department of Education and the Florida Solar Energy Center jointly sponsored a test of occupancy sensors used to control lighting in a Florida school. Occupancy sensors replace conventional light switches and use passive infrared or ultrasonic sensing to control lighting in classroom and other spaces. The test was intended to demonstrate the performance of such controls in saving energy in Florida educational facilities. The evaluation was performed at Northwest Elementary School in Pasco County on Florida's west central coast. A before and after monitoring protocol was utilized for the study which saw lighting circuits for 33 classrooms and seven offices sub-metered. Fifteen minute electrical demand data were taken for six months prior to the lighting controls being modified to accomodate occupancy sensors. Recorded data in the baseline period showed that lighting made up approximately 24% of total electrical energy use at the school. The test building was unusual in that the it contained a modern efficient lighting system with T8 flourescent lamps and electronic ballasts. More importantly, the Pasco County features one of the most aggresive energy management programs of any district school board in the state. Even before installation of the occupancy senors, lighting was effectively controlled by facility staff so as to prevent waste. Given these factors, it was expected that the evaluation in Northwest Elementary would provide insight into the minimum savings that could be expected from the technology in Florida school. A total of 46 occupancy sensors were installed in August, 1995 and then carefully adjusted in terms of location, time delay and sensing sensitivity over the following two weeks. Data were taken in a post retrofit configuration for five months. The analysis of the comparative pre and post retrofit periods showed that the occupancy sensors saved an average of 10% of the pre-retrofit lighting energy (97 kWh/Day) with greater reductions to total energy due to reduced load on the air conditioning system. Most of the savings occurred during the evening hours so that monthly peak electrical demand was little affected. Including costs of installation and commissioning, the payback of the occupancy sensor retrofit was five years with a 21% simple rate of return from the investment. This performance is considered excellent given the fact that the building already had an efficient lighting system which was responsibly controlled prior to the occupancy sensor installation. The project results indicate that with proper installation and adjustment (which was found to be critically important to user acceptance) occupancy sensor technology will provide economically attractive returns either in new or existing Florida educational facilities. In 1993, the Florida Department of Education (FDOE) and the Florida Solar Energy Center (FSEC) began an energy efficiency campaign for Florida's schools. FDOE funded FSEC to produce a comprehensive analysis of energy efficiency options for new educational facilities. The findings of the study were compiled in a training manual and presented at three workshops in the Spring of 1995. However, during the presentations of the research findings to the Florida Educational Facilities Planners Association (FEFPA) many attendees requested information on the performance and economics of retrofit energy efficiency measures. Furthermore, a number of energy-efficiency technologies were identified whose savings were difficult to quantify. FDOE and FSEC then planned to meet this need by staging a series of research-demonstration projects to quantify performance in operating schools. For the first technology demonstration, FSEC chose to study occupancy sensors, primarily because little performance data were available for this technology. Occupancy sensors replace standard light switches and turn off classroom lighting when students and teachers vacate spaces for a given period of time. Since savings are heavily influenced by occupants and their behavior, laboratory studies are impossible. Electricity for interior lighting systems makes up about a third of the energy used in Florida schools as seen in Figure 1. Further, intenal heat produced by interior lighting contributes about 23% of the peak sensible air conditioning load as shown in Figure 2. Thus, lighting consumption indirectly increases facility energy demand by adding to the space cooling loads. Figure 1. Energy end uses in Florida schools. Reduce the operating hours of the system One strategy employs more efficient lamps, ballasts, and fixtures to reduce the energy required to provide the desired level of work place illuminance. The second method employs lighting controls to reduce the amount of time the system is powered. Conventional controls include time clocks that turn lights off after hours and master switches which use "sweep control" to turn off a zone or building. Occupancy sensors match the electrical lighting to the space conditions based on space use. While more efficient systems, such as T8 lamps with electronic ballasts, have repeatedly produced significant savings, objective data on the energy reduction from occupancy sensors are more elusive. Savings critically depend on how occupants use a space. Therefore, savings for schools hinge on a critical question: How often and how long are school spaces currently unoccupied with the lights unintentionally left on? As an inexpensive option and potential retrofit measure, occupancy sensors appeal to the school building industry. On the other hand, problems with early installations have damaged the reputation of the technology for some users (Energy User News, 1991). (1) The devices themselves are of two primary types: passive infrared and ultrasonic as described in Appendix A. Reports suggested that older products failed regularly or turned off lights on occupied classrooms, requiring extra maintenance and/or causing frustration for school personnel. While many reported these type of problems, others expressed a positive opinion of occupancy sensors. These reports typically came from persons with more recent experience, suggesting that the reliability of the technology had improved. Even those workshop attendees who viewed the sensors positively, however, reported problems with performance. These problems include "false positives" and "false negatives"; triggering the lights on or off at inappropriate times. It was hoped that FSEC's assessment would provide objective performance data on occupancy sensors for Florida's school design and management community and help resolve these questions. Some educational facilities planners questioned the economics of occupancy sensors. They argued that classrooms, which make up the bulk of primary and secondary school facilities, do not remain unoccupied for long periods and that most teachers diligently turn lights off upon leaving rooms. Many expressed the opinion that occupancy sensors would be most appropriate for intermittently used spaces, such as break and copy rooms. However, without empirical evidence, the performance and economics of the technology remain the subject of speculation. Generally, lighting energy reductions from occupancy sensors will roughly follow room vacancy rates. Savings will be, of course, modified by occupant responsiveness in turning off lights in unoccupied areas. Measured lighting energy savings from occupancy sensor installations are surprisingly sparse. Both the Electric Power Research Institute and ASHRAE estimates an average 30% savings from this technology in generic assessments for commercial buildings (EPRI, 1993; ASHRAE, 1989). These data are generally supported by a utility evaluation performed by Consolidated Edision which found a 30% reduction in average lighting demand for its projects which installed occupancy sensors (Audin, 1993). Representatives from the District School Board of Pasco County School approached FSEC at the Summer 1994 meeting of the Florida Educational Facilities Planners. The school's representatives expressed interest in participating in a field study. Pasco County's Energy Management division funds energy retrofits out of a revolving fund initiated by the school board and probably represents the most progressive of such programs in the state. Northwest Elementary school, on Florida's west coast near Hudson, was chosen for the demonstration. The school facility is comprised of one main building, a kindergarten annex, and several portable classroom units. The 58,000 ft2 main building, which received the occupancy sensor installation includes 33 classrooms, seven offices and a cafeteria. The main building is shown as Figure 3; one of the wall mounted occupancy sensors is seen in Figure 4. Figure 3. 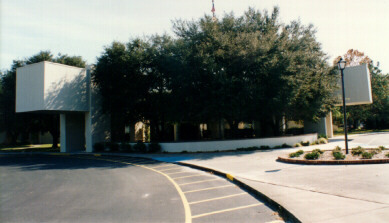 Exterior of Northwest Elementary School in Pasco County, Florida. The school was the site of an energy saving technology demonstration by the Florida Department of Education. The test was to determine if occupancy sensors can save lighting energy. Figure 4. FSEC engineer demonstrates the operation of wall mount occupancy sensor. Some 46 sensors were installed at the school for the test project. Each electronically detects the motion of students and teachers through infrared-sensing and automatically turns off lights when no motion is detected over a given period of time. There are some 200 school days per year, not including holidays, weekends and summer recess. The school day extends from 7:00 AM - 3:45 PM, although office and janitorial activities often extend beyond the formal school day schedule. The occupancy sensors and monitoring equipment were obtained by FSEC and the installation labor were provided by Withlacoochee River Electric Cooperative. FSEC technicians audited the school on December 21, 1994 and subsequently drew up a plan for instrumentation to monitor its energy use. A survey of the school's electrical system revealed eleven circuits of HVAC, five lighting circuits, two circuits of portable classrooms and two circuits supplying a kindergarten addition. Occupancy sensors emerged as the choice for improved lighting efficiency at the school as it has few windows, but a modern efficient lighting system. A combination of two lamp T10/magnetic ballast and T8/electronic ballast fixtures illuminate each space. The audit team found that monitoring the portables and the kindergarten suite was not feasible since separating the lighting load for these spaces was cost prohibitive. The main building, comprised of classroom pods, administrative spaces, a media center, and a cafeteria, became the subject of the study. After reviewing the audit details, an equipment list was established and the following metering equipment was obtained. The Energy Manager for the school district, agreed to provide a pulse count meter to measure total electrical consumption and a dedicated telephone line for daily retrieval of the monitored data. All equipment was then obtained, configured and calibrated. FSEC instrumented the facility on February 25, 1995 as shown in Figures 5 and 6. The data acquisition system measures various parameters to assess the savings associated with the retrofit. Monitored meteorological conditions were limited to ambient air temperature because the retrofit would not likely be affected by weather conditions. Table 2 lists the monitored parameters and the associated engineering units. Figure 5. 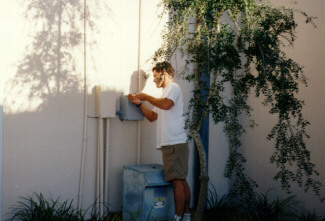 FSEC engineer, John Sherwin, installs an electric power transducer as part of the instrumentation at Northwest Elementary School on February 25, 1994. Temperature measurements were obtained using type-T thermocouples. A vented enclosure shielded the ambient air temperature sensor from solar radiation. Ohio Semitronics Watt-hour transducers with split core current transformers measured lighting electricity use and are accurate to with 2% of their full-range wattage (RMS). Analog and pulse outputs from the instrumentation were converted to digital format and stored using a Campbell Scientific model CR10 datalogger. Measurements are made at 0.2 Hz and averaged and stored every 15 minutes. Electrical power was totaled over 15 minute intervals. Data were transferred from the datalogger via telephone modem to FSEC's VAX 4000 nightly. Once processed and archived, the daily data for the school were automatically plotted. Plots were inspected each morning by an FSEC project engineer to ensure reliable data collection and proper metering. Lighting energy is lowered by a reduction of lighting hours, while total energy is conserved by reduction of direct lighting energy as well as heat produced by lights as a component of the heating, ventilation, and air conditioning (HVAC) load. These two parameters, total power and lighting power, appear on FSEC's daily graphs of measured data. An example of the daily data, for December 1st, 1995 is shown in Figure 7. Figure 7. Plot of total lighting power energy demand on Friday, December 1, 1995.
were fitted around the appropriate legs to measure lighting power in the main building. 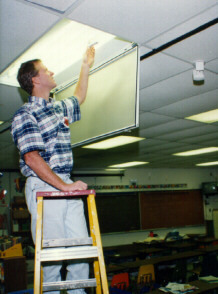 The retrofit was scheduled for August 1995 to allow a roof repair and modifications to pod classrooms in the early summer, but to secure the retrofit by the start of the 1995-1996 school year. 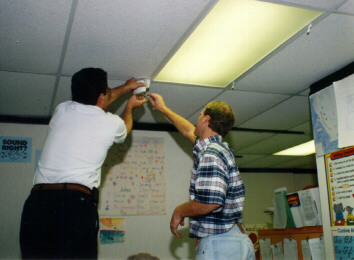 A total of 46 passive infrared (PIR) occupancy sensors were installed at Northwest Elementary from August 7, 1995 to August 15, 1995. The installation was performed by a team of two electricians, a Research Engineer from the Florida Solar Energy Center and the Energy Coordinator from Pasco County. Approximately 33 classrooms, seven offices, and a cafeteria were equipped with occupancy sensors, as shown in Figure 8. 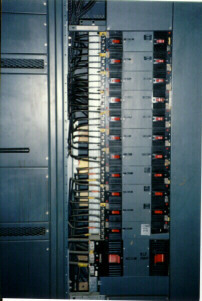 Several offices had the wall switches replaced with automatic wall switches. The remainder of the spaces (classrooms, cafeteria, and larger offices) received ceiling mounted sensors. The broad coverage of the ceiling mounted sensor minimized the need for multiple occupancy sensors in all but five areas. The classroom lighting layout and occupancy sensor installation and placement is illustrated in Figures 9 and 10. Figure 8. 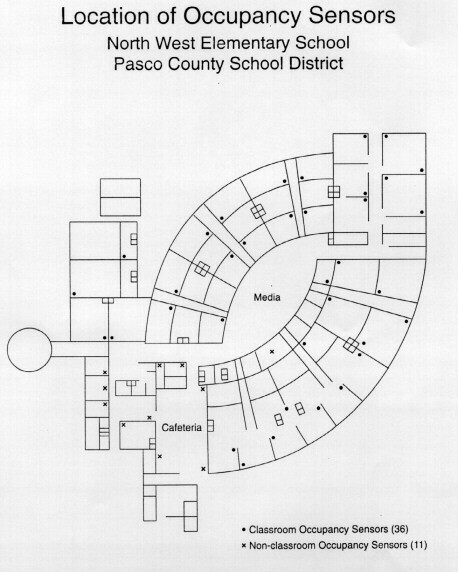 Floor plan of main building at Northwest Elementary School in Pasco County indicating location of occupancy sensors. Figure 9. Interior layout of lighting system in a typical classroom at Northwest Elementary. The lighting fixtures consist of four T-8 fluorescent lamps with a electronic ballast in a white troffer covered by an acrylic prismatic diffuser. Figure 10. 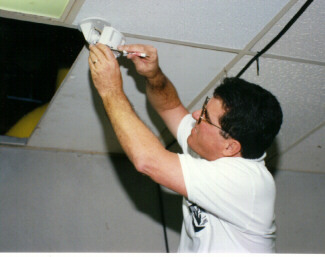 FSEC engineer David Floyd installs run-time metering equipment inside a single classroom lighting fixture. Note the ceiling mounted occupancy sensor, located so as to scan the entire classroom for motion. Manufacturer literature for the selected sensors is attached in Appendix A with a brief description of occupancy sensor technology. Several other resources exist describing appropriate application of occupancy sensors and issues regarding their effective use (RPI, 1992; Audin, 1993; EPRI, 1994). Classroom occupancy sensors were located in a corner near the teachers desk to minimize false "offs" when only the teacher was in the classroom. All occupancy sensors were set to a 12 minute time delay, which has worked well in most situations. Shorter time delays will increase savings, however, false "offs" may also increase. Past installation experience has shown that unless the occupancy sensors are properly located, aimed and tested by experienced personnel, poor savings and occupant dissatisfaction will result. Figures 11 and 12 show time delay adjustment on one the ceiling-mounted occupancy sensors as well as use of run time loggers to verify control performances. Figure 11. Pasco County School Board Energy Coordinator, Mike Woodall, assists with the time delay adjustment of one of the ceiling mounted occupancy sensors. The project found that proper set-up of the time delay and sensitivity of the controls was essential to acceptable performance. Accurate assessment of lighting savings must be performed when the occupancy patterns vary the least from the pre and post periods. Since the most regular occupancy patterns occur during school days, accurate assessment of lighting savings can only be performed during this time period. Although savings are not being evaluated for the entire year, school days account for approximately 93% of the total yearly lighting demand and therefore are a good indicator of yearly savings. Average daily total electrical consumption and average daily lighting consumption for the pre and post-retrofit monitoring period are shown in Figure 13 for school days. The pre-retrofit period extended from February 27, 1995 - June 9, 1995, comprising some 69 school days and 30 non-school days. The post retrofit period began on September 5, 1995 and ended on December 8, 1995, comprising 84 school days and 28 non-school days. Of the total power demand during the pre-retrofit periods, 24.2% was used for interior lighting. 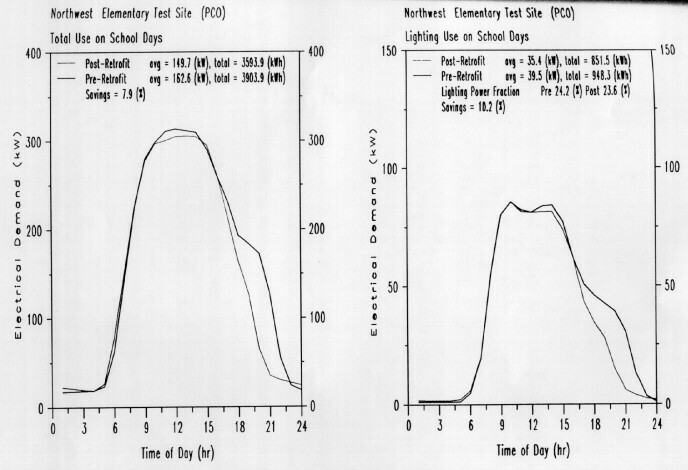 This is consistent with simulation predictions for a school facility with a T8 lighting system (McIlvaine, et al, 1994). Lighting systems using older technology such as T12 lamps and magnetic ballasts (which comprise the lighting systems in the majority of Florida schools) would use a greater percentage of the total for lighting power and would benefit more from the use of occupancy sensors. Upon first examination of the lighting use plot in Figure 13, it is evident that prior to the installation of the occupancy sensors there was little unintentional lighting during classroom hours. A small dip in the post retrofit plot can be seen between 9:30 AM and 1:45 PM, when lights are manually turned off during lunch. Also, when the school is vacated (when the night custodians leave) from approximately 10 PM until the next morning, lights were almost never left on. The diligent operation is due primarily to the effective energy management program in Pasco County (Appendix C). Thus, a fundamental point to be made regarding this study is that the savings level from adding occupancy sensors is likely to be as low as might be seen in almost any educational facility. Other schools with typically less efficient lamps and less responsible operation would experience considerably greater savings. Figure 12. 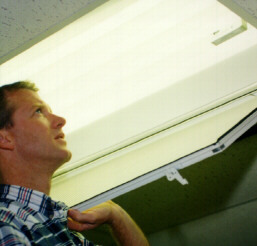 David Floyd checks the function of a time of use lighting logger (small white box) which is installed inside the lighting fixture. The lighting loggers were used to verify the proper performance of the occupancy sensor controls during unoccupied periods. Figure 13. 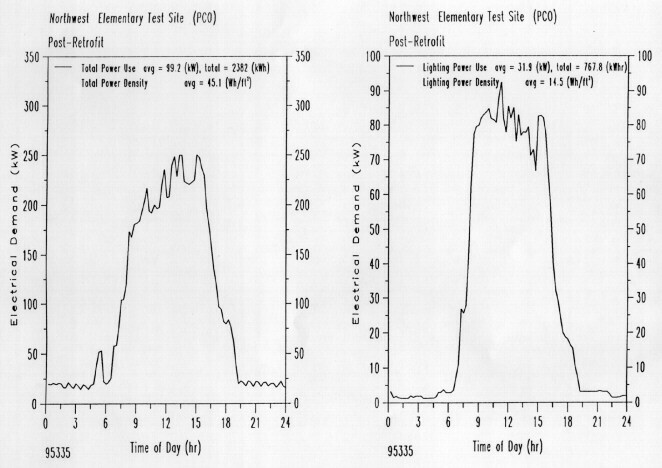 Average total (left) and lighting (right) electricity demand profiles measured at Northwest Elementary five months before and after occupancy sensor retrofit. The post retrofit electrical demand lighting profile in Figure 13 shows the additional savings produced by the occupancy sensors. Savings are seen primarily after the school day ends, although there are some reductions evident between lunch and 4:30 PM. Approximately 124 kWh are being saved each school day by the retrofit. This results in a 10.2% savings (96.8 kWh/school day) in lighting, which is quite substantial for a school that already practices good energy management. Analysis of data on non school days is inconclusive since the occupancy patterns changed between the pre and post periods. However, previous research at FSEC suggests that if there are savings during non-school days, they are small or possibly negative. However 93% of the total power used during the year is on school days, and therefore would not be influenced greatly by the non-school day results. Using the lighting load savings between the pre and post periods (96.8 kWh/school day) and assuming that there are 200 school days per year the total lighting savings for the year is 19,360 kWh. Since lighting use also increases the load on the cooling system, a reduction in lighting use would also lower the cooling load, especially in central Florida where space cooling is the dominant end-use (approximately 90% of the year or 10.8 months). Total energy savings must also include the reduction in the cooling load. The economic analysis will consider the lighting savings as well as the additional savings from cooling load reduction. The resulting total yearly energy savings of 26,620 kWh includes lighting (19,360 kWh) and cooling (7,260 kWh). Withlacoochee River Electric Cooperative provides the power for Northwest Elementary School. Their monthly utility rate is based on a fixed consumer charge ($24.63), a demand charge ($6.16/kW), and a energy charge ($.04765/kWh). Examination of the lighting demand profile in Figure 13 shows no reduction in the average maximum demand between the pre and post periods. Most of the savings occur during the evening hours. Thus the only monetary savings will be due to a reduction in energy (kWh). It is important to note, however, that this is not always the case. When occupancy sensors are used to control a building with a varying occupancy schedule, such as a university, demand savings may be significant. Retrofit of occupancy sensors in a Florida school showed a measured reduction in lighting energy use of 10.2%. The economics were also attractive with a 4.8 year payback and a 21% simple rate of return. The resulting savings from this project are very promising considering that the schools energy was already being managed quite well and the lighting systems efficiency was already improved through ballast/lamp upgrades. If the schools lighting system was typical (magnetic ballasts with T12 lamps), it would be approximately 40% less efficient. Lighting savings would increase to 27,104 kWh/year and cooling savings would increase to 10,164 kWh/year. Under these circumstances the total monetary savings would be $1,776 with a payback period of 3.4 years. If lights are frequently left on after hours, the use of occupancy sensors becomes even more attractive. We estimate that unintentional lighting hours, and therefore saving, would be greater at most Florida educational facilities. Our findings clearly showed an attractive economic performance of an occupancy sensor retrofit in a Florida school which was already practicing diligent energy management activities. However, to gauge typical savings that might be experienced in Florida schools, we suggest that the study be repeated in another more typical educational facility with less stringent energy management activities. This would help to better define average savings levels from this technology. The Florida Solar Energy Center would like to express its appreciation of the Florida Department of Education in supporting this research. The cooperation of the Pasco County School Board and the staff of the Northwest Elementary School is also gratefully acknowledged. Finally, the WattStopper Corporation provided a generous accommodation for the purchase of the equipment in return for an objective third party assessment. BDAC Energy Files. 1995, "Occupancy Sensor Study," Building Design Assistance Center, FSEC, Vol. 3, No. 1, Cocoa, FL. Watt Stopper, 1994. "Class Room Energy Savings with Dual Technology," Watt Stopper Corporation, Santa Clara, CA. Synergic Resources Corporation, 1992. Electricity Conservation and Energy Efficiency in Florida: Phase I Final Report. SRC Rpt. 7777-RC, Florida Energy Office, Tallahassee, FL. McIlvaine, J.E.R., Mallette, M.M., Parker, D.S., Lapujade, P., Floyd, D.B., Schrum, L., and Stedman, T.C., 1994. Energy Efficient Design for Florida Educational Facilities. Florida Department of Education, Tallahassee, and the Florida Solar Energy Center, Cape Canaveral. Audin, L. 1993. "Occupancy Sensors: Promise and Pitfalls," E-Source Tech Update, Old Snowmass, CO.
ASHRAE, 1989. ASHRAE Standard 90.1: Energy Efficient Design of New Buildings Except New Low Rise Residential Buildings, American Society of Heating, Refrigerating and Air Conditioning Engineers, Atlanta, GA.
CADDET, 1995. "Saving Energy With Efficient Lighting in Commercial Buildings," Maxi Brochure 01, Centre for the Analysis and Dissemination of Demonstrated Energy Technologies, Sittard, The Netherlands. Energy User News, 1991. "Maturing Technology Brings Growing Acceptance of Sensors," Energy User News Technology Report, September, 1991. EPRI, 1993. TAG Technical Assessment Guide, Vol. 2: Electricity End Use, Pt. 2: Commercial Electricity Use, Electric Power Research Institute, Palo Alto, CA. EPRI, 1994. "Occupancy Sensors: Positive On/Off Lighting Control," EPRI BR-100323, Electric Power Research Institute, Palo Alto, CA. Novitas, 1993. "Cost-Benefit Calculations," product literature, Novitas Corp., Culver City, CA. Rensaelaer Polytechnic Institute, 1992. Specifier Reports: Occupancy Sensors, Vol. 1, No. 5, National Lighting Product Information Program, October, 1992. Richman, E., Dittmer, A.L. and Keller, J.M., 1994. Field Analysis of Occupancy Sensor Operation: Parameters Affecting Lighting Energy Savings, PNL-10135, Pacific Northwest Laboratory, Richland, WA. Occupancy sensors, also called motion sensors, react to disturbance in a space. They are designed to turn lights or other equipment on when the space is occupied and off (after a specified time delay) when the space is vacated. The most common load controlled is lighting; however, more recently occupancy sensors can be designed to control heating ventilating and air conditioning (HVAC), and office equipment (monitors, printers, fans, etc.). The most common occupancy sensors in use today use ultrasonic or infrared sensing techniques to detect occupancy. Each technology has its advantages and disadvantages. Ultrasonic (US) occupancy sensors emit inaudible sound waves that bounce off objects in the room. It then measures the time it takes for the sound wave to return. If there is any movement in the controlled area the sound waves will return at a faster or slower rate, resulting in a Doppler shift and occupancy detection. US sensors can detect motion around corners. This makes them useful for spaces with large obstructions, such as bath rooms. US sensors work best when movement is toward and away from the sensor. The magnitude of required motion increases with distance from the sensor. Passive Infrared (PIR) sensors sense occupancy by "noticing" the difference between a human body and the background. They accomplish this by dividing the coverage area into zones. When a person passes from one zone to another, the sensor detects occupancy. The better sensors have more coverage zones. PIR sensors are a "line of site" sensor and must have an unobstructed view of the entire coverage area. PIR sensors work best when the movement is tangential to the sensor. The magnitude of motion required to trigger the sensor is directly proportional to the distance from the sensor. One or both sensor types can be incorporated into a myriad of different designs. The most common being automatic wall switches and ceiling mounted sensors. 1. Each sensor costs about $120 when purchased and installed in quantitiy.